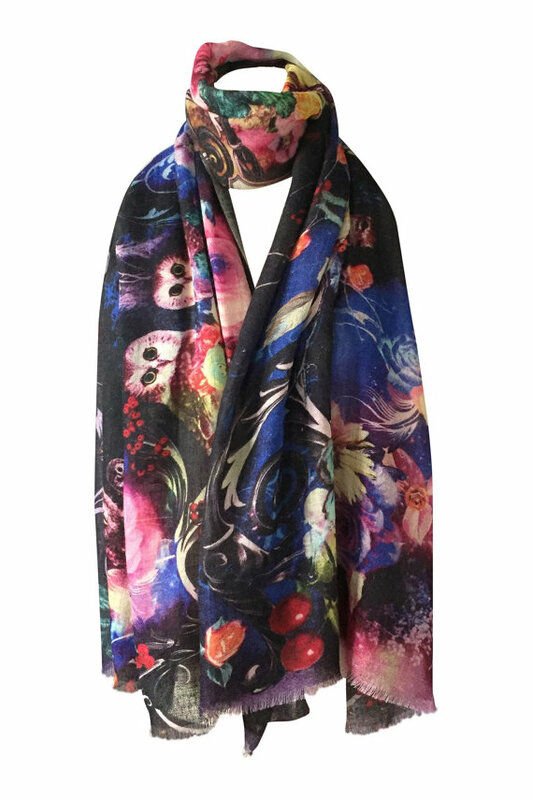 Mysterious, colorful Aurora Borealis and owls woodland printed cashmere wrap scarf for autumn fall – designed in the UK and sustainably made in Kashmir, India. A magical 100% cashmere wrap with a colorful nighttime owls woodland scene basked in the Aurora Borealis and a mysterious moonlight glow. Beautifully eye-catching, this nocturnal forest scene features barn owls with baby owls, squirrels, plants, and fall flowers surrounding them. The owls and trees were hand drawn, and then the design digitally adapted to bring out the vivid colors of the Northern Lights, in addition to the moon’s supernatural glow. A dark background further intensifies the striking purple, blue, and pink colors in this exclusive Pashmala design. This image was inspired by childhood memories of growing up in rural Midwestern Canada where my family and I would watch in awe as the Aurora Borealis danced across the night sky. Without pollution and bright city lights to obscure our view, the Aurora Borealis was truly a sight to behold. 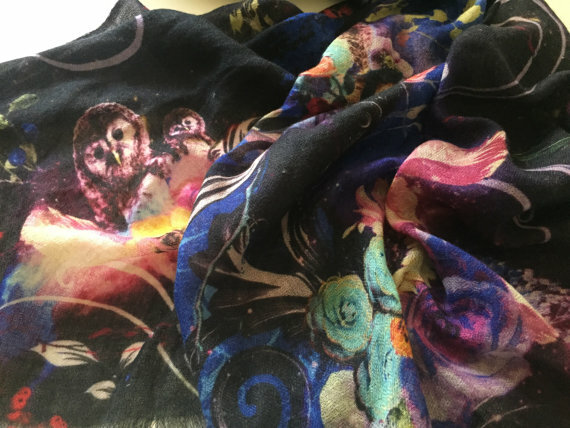 Posted on March 1, 2017 by anna stephen Murphy and tagged woodland cashmere scarf owl scarf nature wrao nature scarf aurora borealis scarf northern lights scarf canadian nature scarf owl cashmere wrap squirrel scarf tree scarf.